Enjoy a tour through the Breakers in Newport Rhode Island. In the afternoon, travel to Providence to see WaterFire Salute to Veterans. Day 1: Depart southern New Hampshire or Boston for Providence Rhode Island. Enjoy a self guided tour via Audiphones through the Breakers Mansion. The Breakers is the grandest of Newport's summer "cottages" and a symbol of the Vanderbilt family's social and financial preeminence in turn of the century America.You can take your time and listen to what interests you. In the afternoon we will travel a short distance to Providence for an overnight stay at the Biltmore Hotel. Tonight water fire starts at 7 PM where bonfires are lit along the River to synchronized music. 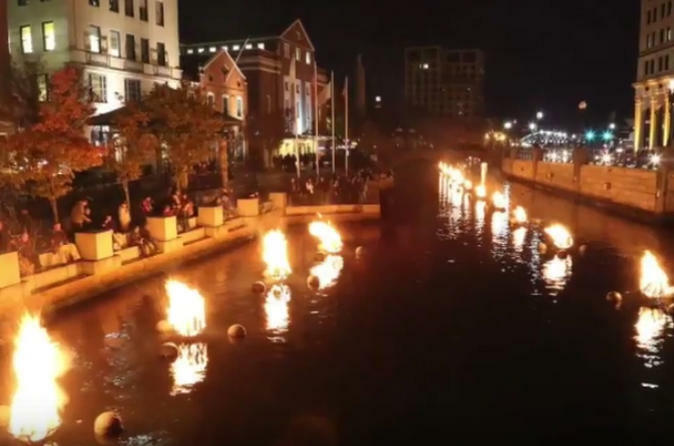 The hours of Water fire are 7 – midnight but you can return to the hotel at any time or enjoy the festivities along the river. Prior to Water fire dinner will be included at a local restaurant. Day 2: This morning sleep in or use the facilities at the Biltmore Hotel. At 11:00 we will head to Milk Money Bistro for Brunch.